It has been an age and a half since I’ve had a Dutch baby pancake. And I don’t know why, really, because every time I do actually enjoy one I always say to myself (probably with a mouthful of pancake), “Self, you should really eat Dutch baby pancakes more often.” I never listen. That especially was the case this weekend, when I decided to break my two year long streak of non-Dutch baby pancake breakfasting by making this buckwheat Dutch baby. I had already eaten breakfast that day, but when this beauty emerged from the oven at mid-morning, all warm and topped with a fresh, fruity compote and cool basil whipped cream, I knew a second breakfast was in order. See, mornings around here are early these days. Even before children I was an early riser, but I’d allow myself a good hour of sitting on the couch drinking a cup of coffee alone before interacting with the world (it was for everyone’s benefit). Nowadays, the day begins with a bang — or maybe more of a baby cry and a groggy roll out of bed and then a few mumbles of, “Did you make the coffee?” “I didn’t make the coffee yet, no.” “I need the coffee.” “OK, I’ll make the coffee.” And then one of us makes the glorious coffee while the other pulls out all the baby toys and books and just like that, the day begins. But we’ve started doing something in those early hours that I really love, and it happened quite unexpectedly. If Elliott is home for the morning, we all take the time to eat breakfast together. And oftentimes, we’ll make something more special than a quick bowl of oatmeal or eggs on toast. Sometimes it’s just a matter of adding bacon to the plate, but other times it’s French toast or a frittata, with big mugs of hot coffee and bowls of fresh fruit on the side. It’s nothing extraordinary or fancy, but it’s special to us and I hope to keep it up. And the next time it does happen, I know this Dutch baby pancake will be on the table. There may be a few components and dishes required for the recipe, but despite all that it’s actually quite easy. 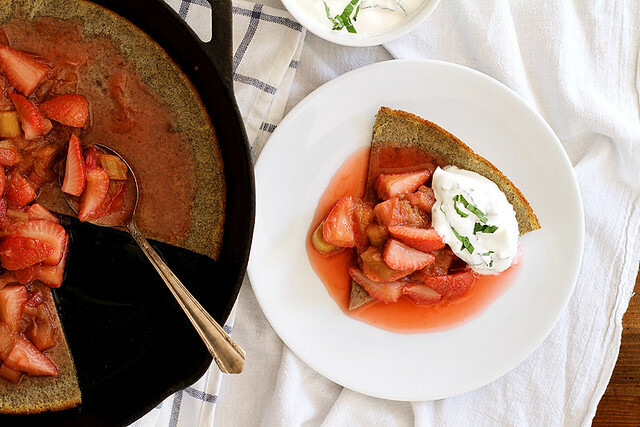 You’re basically making a giant pancake in the oven (made even easier with Bob’s Red Mill’s awesome buckwheat pancake mix), and while you do, you can make a quick strawberry rhubarb compote and homemade whipped cream flecked with fresh ribbons of basil. Once the pancake is done, you top it with the compote and a dollop of whipped cream and just like that, a special, fresh and flavorful breakfast is ready for the eating. 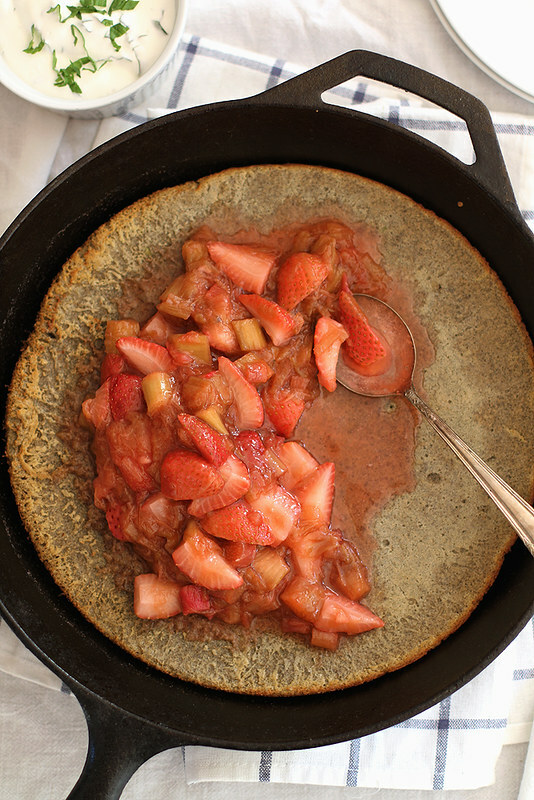 Heck, I don’t even think I can wait until tomorrow to make another one of these Dutch baby pancakes. Second breakfast it is. 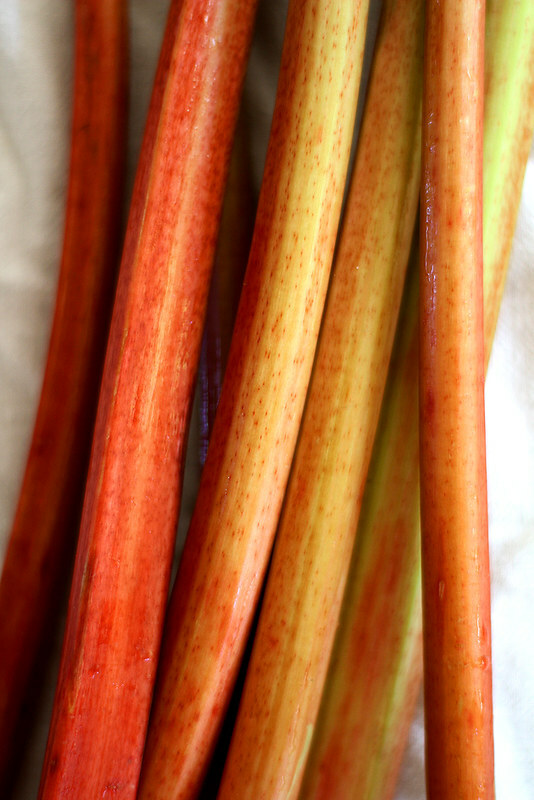 In a large Dutch oven or heavy-bottomed saucepan over medium heat, bring rhubarb, sugar and water to a simmer. Cook, stirring occasionally, 7 minutes just until rhubarb is tender. 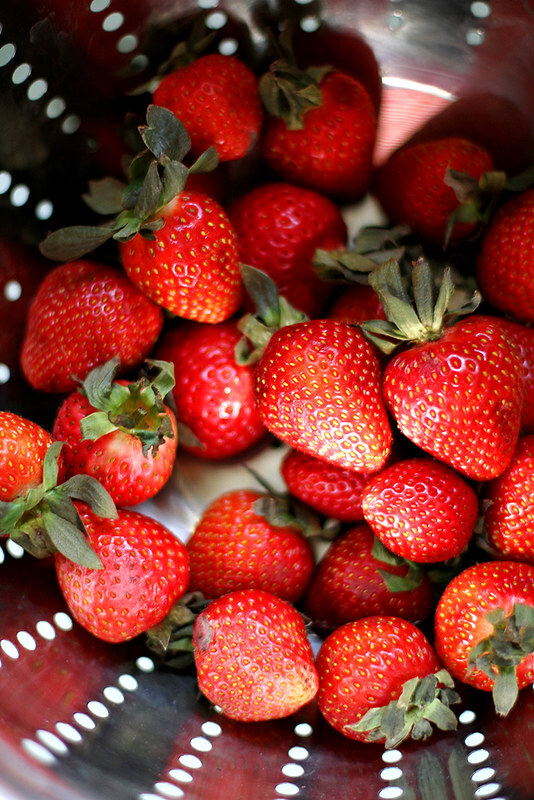 Remove from heat; stir in strawberries. Set aside to cool. Meanwhile, heat oven to 425 degrees F. Place a 12-inch cast-iron skillet on middle rack of oven. Melt butter in a small saucepan over medium heat; set aside to cool slightly. In a large bowl using an electric hand mixer, beat eggs 1 minute until pale and frothy. Add milk, pancake mix, vanilla and salt. Add 1 tablespoon melted butter. Beat 1 minute until well combined. Remove skillet from oven. Pour in remaining butter; swirl to coat. Pour batter into skillet. Immediately return skillet to middle rack of oven and bake 12 to 15 minutes until pancake is golden and baked through. While pancake bakes, make whipped cream: In a medium bowl, beat heavy cream until stiff peaks form. Fold in fresh basil. Top warm pancake with compote; serve with dollops of whipped cream. 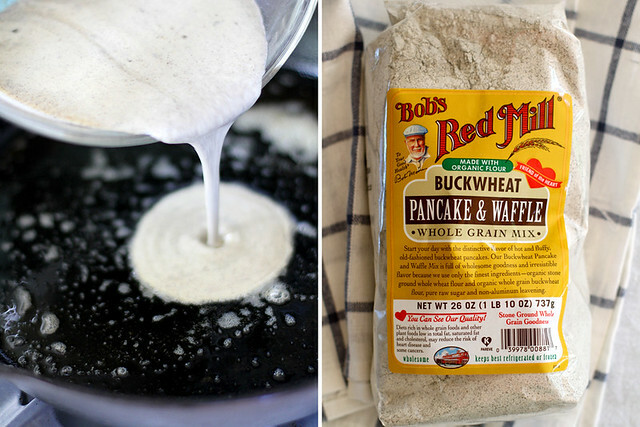 This is my all time favorite pancake mix – why have I never made it into a gorgeous dessert?! I’ve never met a dutch baby that I didn’t like:) And this rhubarb version looks off the charts! Wow! I love rhubarb and buckwheat – this looks like a perfect excuse to eat them more. Plus, that basil whipped cream sounds to die for! Eating breakfast as a family is so valuable – it’s great you lovebirds re prioritizing it when possible. I tend to eat breakfast over the kitchen sink but enjoy getting together with my family to chow and chat. 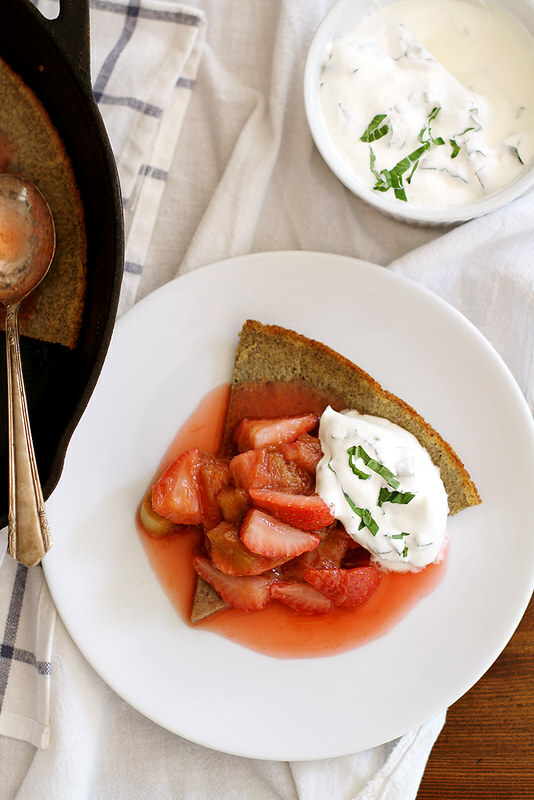 Loving this buckwheat dutch baby!! I only recently started making dutch babies and haven’t given a buckwheat version a shot yet – I can tasty the earthy sweet flavors now. And your topping?! WHOA! We are strawberry rhubarb twinsies today! 🙂 Looks beautiful Stephanie! Lauren — Yes, I know! I forgot to mention that yesterday. 🙂 Thanks, friend! Ohhh I love this idea. I am such a big fan of strawberry-rhubarb too so that just takes it over the top for me. Buckwheat?! Count me in!! This looks awesome! Love that this dutch baby is made with buckwheat. 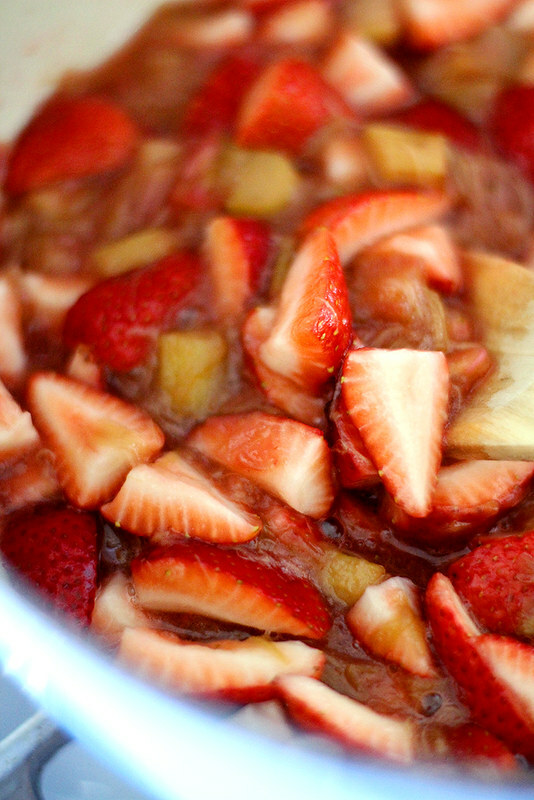 And that strawberry rhubarb compote sounds heavenly! I’m so stoked it’s rhubarb season! I just bought my first stalks this weekend. This dutch baby looks amazingly delicious! I have still yet to make a dutch baby myself… definitely need to change that. What a lovely new tradition you’ve started. I’m pretty good about making breakfasts on the weekends, but the weekdays? Not a chance. My husband refuses to eat anything and I’m always running five minutes behind so I end up scarfing down an egg-in-a-hole or peanut butter toast on the fly. It would be so nice to just sit and be and ENJOY breakfast before the day begins. If I could start off every day with one of these dutch babies, I would be one happy chica. Dutch babies (we called them oven pancakes) were a classic Dad’s dinner night for us growing up–mom made vegetables, dad made dessert for dinner. The best. Janelle — I love that!! I love your new tradition – eating breakfast together is the best 🙂 And so is this gorgeous dutch baby! 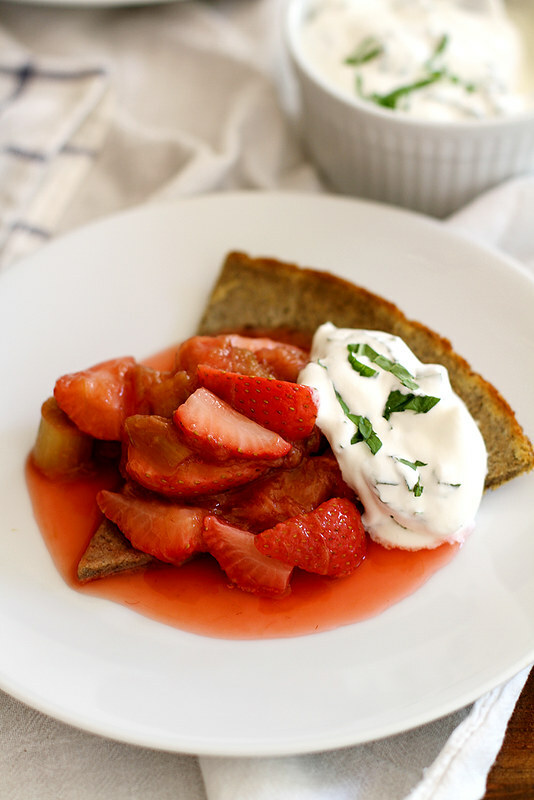 The strawberry/rhubarb compote and basil whipped cream sound absolutely glorious! Can’t beat a good dutch baby pancake! Love these flavors! I’ve been trying out different flours and I have yet to try buckwheat! The rhubarb and strawberry combo sounds amazing!! We don’t get lots of breakfasts together either but when we do we make the weekend ones count. I just made blueberry dutch baby this past weekend and now I am adding this to my list. Love the compote and whipped cream!! Oh that strawberry compote looks just scrumptious! And that basil whipped cream – I’m so in! Viva la pancake! Happy feasting! Looks like a delicious recipe…light and fluffily pancakes. Thanks! ?